Save your own seed for sowing the following year ! You will be continuing a time honoured tradition. You can do this from any of our seed in any of our catalogues because it is traditional open-pollinated seed. Here are notes to help you save bean and pea seed. Make sure that you make the most of the frost-free growing season (in UK this is June to September inclusive). Sow your seeds in single pots at the end of May in a greenhouse or on a sunny windowsill. When the roots fill the pots, and the second set of leaves have appeared, harden off your plants over several days. 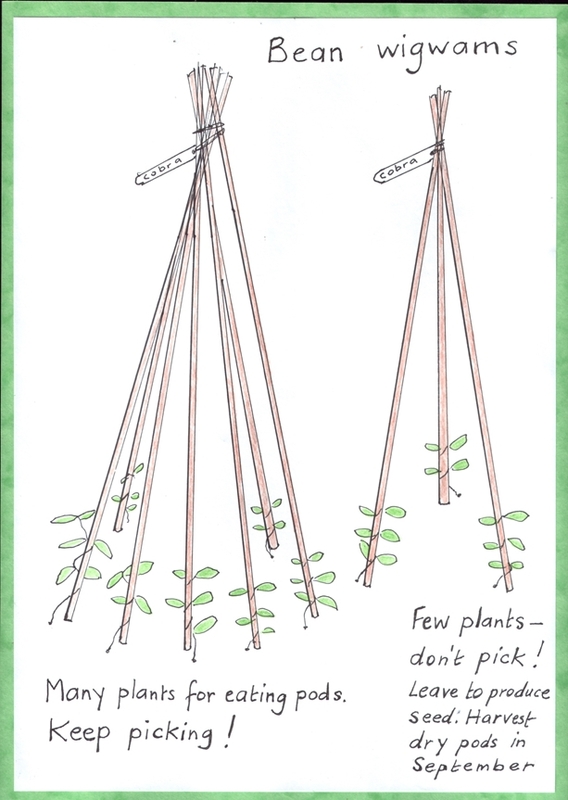 Then plant them out in rows (or wigwam/tepee set-ups) and encourage them up their canes (climbing varieties). They climb anti-clockwise. Always make sure your cane supports are strong enough and are very firmly in the ground. At maturity, both weight and wind resistance can be high. Labelling is important. Label the canes with the bean variety. If you intend to leave all to go to seed, a large sturdy tepee set-up is fine. If you intend to pick some beans at the green stage, and leave some for seed, it is a good idea to plant up 2 tepees side by side with the same bean variety. One tepee (most canes) will be for picking the pods to eat. Keep picking and do not leave any. The other tepee (fewer canes) will be for leaving all the pods to go to seed – you will be harvesting the brownish dry pods around the end of September. Alternatively plant in a row and leave two or three plants at the end of the row for your seed crop. Remember not to pick any pods at all from these plants. Keep picking pods often from the other plants for eating. This will encourage more and more beans to come. Dwarf varieties of beans getting heavy with pods will need to be tied to short stakes. A French bean ready for harvesting for seed. Leave seeds drying until December. All carefully labelled! Good storage is important. Store your seeds in brown paper envelopes. Label the envelopes with the bean variety and the year of harvest. The envelopes can then be stored in a plastic box with a lid. This is to stop moisture (and mice !) getting in. The box should then be stored in a dry and cool (but not frosty) place. A cold dry garage would be a good place, but not a damp shed and not a greenhouse. If you intend to eat most of your seed harvest in casseroles, remember to save some seed for sowing the following year! All your seed for sowing the following year is ideally stored in a closed container in the salad compartment of your fridge – at a constant low temperature of 5 degrees and with low humidity. 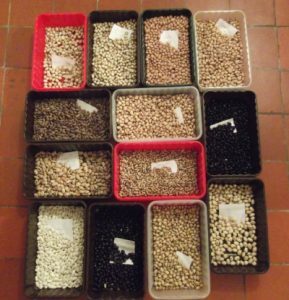 All the above notes can be adapted for Runner Beans – note that these seeds are larger and will take longer to get the moisture content down to avoid mould. Broad (Fava)Beans and Peas will be grown earlier and will therefore be ready for seed-collecting earlier. Sowing and harvesting at the right times, and correct storage, will ensure your seeds will be viable for at least the next two years. Give approximately 10m isolation (separation) distance between different French Bean varieties to ensure that they do not cross-pollinate with each other. Likewise with white-flowered runner beans. Peas tend to self-pollinate so you can expect your pea seeds to stay pure. Red-flowered Runner Beans tend to cross-pollinate with neighbours’ Runner Beans (they may not be growing the same variety as you!). Broad (Fava) Beans likewise are much harder to keep pure. All the same principles apply to any seed-saving of all plant varieties including flowers – growing well, finding out about possible cross-pollination, leaving to dry on the plant, harvesting, labelling, and storing well.